Product Review Guest Post - by theYoungerSon! Today was product review day. 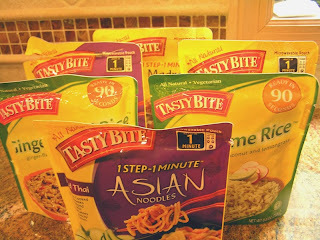 Tasty Bite, an Indian food company, had sent me a box of 6 of their kosher shelf stable heat-and-eat entrees and sides for evaluation. And by me, I mean me and Marc, aka theYoungerSon. In case I hadn't mentioned it in an earlier post, Marc is a well-respected movie critic for HBO Watch and I Heard In. He is also a young adult who can still eat like growing teenager, which is akin to a starving linebacker at an all-you-can-eat buffet. Drawing upon his many years of experience in this particular area, he has graciously volunteered to help me evaluate the Tasty Bite samples provided. 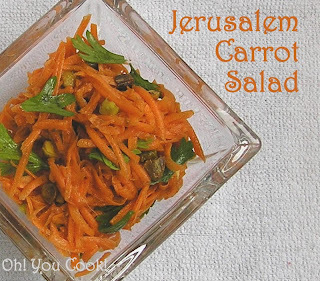 I liked my original version of Jersusalem Carrot Salad ... quite alot in fact. But after making it a few times, we decided it wasn't close enough to the carrot salad we enjoyed during our trip to Israel this past fall. So I went and tinkered with it a bit and came up with this version. Didn't bother this time with the extra spice of toasting the spices since at the moment it's 90F outside (just ignore that I have air conditioning inside, 'kay?). Anyhow, the extra lemon, plus the tiny bit of coriander pretty much nails it. Until I tinker with it yet again. 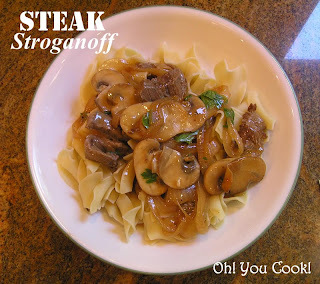 A short while back, youngerSon said, "I'd like stroganoff for dinner sometime this week." I thought as usual he wanted my easy version that is stroganoff in name only, and since I happened to have a package of defrosted ground beef in the fridge, I banged out a batch that very evening and called everyone down to the table. YoungerSon looked at his plate then looked at me with a confused expression. Seems that I missed one majorly important word in his request ... the exact words were "steak stroganoff." Oopsie. Majorly fail on my part. So tonight I made steak stroganoff. This version takes a little more work and a little more time, but is truly worth it. The cooking is in several parts. To avoid overcooking the steak slices, make sure they are still very pink when you remove them from the skillet; they will finish cooking when returned to the sauce.